It has been a crazy couple of weeks at J&S getting some exciting new projects up and running or to the final stages. More about that later. But now we finally have time to share a couple of new designs that are out there that use our yarns with you. Firstly is the Alcott slipover that is highlighted on the front page of The Knitter magazine, where it is featured, as a ‘Fair Isle tank top in candy colours’. It is designed by Mary Henderson who is a designer and knitter from Somerset. 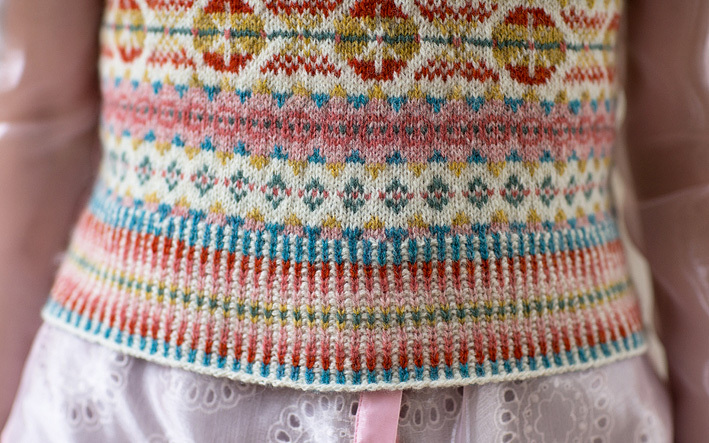 Mary has a great skill in combining colours in Fair Isle designs. She will be here for Shetland Wool Week giving a class in our shop on using the steeking method, in which participants will be able to knit, finish and take away their very own mug hug in an afternoon. You can find out more about Wool Week classes and events here. Inspiration comes from many places and happens in unexpected ways. Since the age of 8 I have been in love with Fair Isle knitting – I saw a photograph of a jumper in the Lady’s Home Journal (US publication) and wanted to learn how to knit it. It was the start of a lifelong journey. I have been knitting and learning ever since. In 2009 I realised a lifetime dream and travelled to Shetland for the In the Loop conference and finally visited Jamieson and Smith Woolbrokers (having ordered from them many times over the years). I was able to see all the colours and play around with colour combinations: traditional ones plus some unlikely ones. It is great to see how colours work together: how the colours ‘in between’ change and enhance the main colours and how a single, strong contrast in the horizon line can pull a colourway together and make it sing. Luckily the staff are very tolerant! I put together various colourways and organised for it to be posted home to Somerset. Roll on 18 months. I was very fortunate to be part of the commissioning process for The Knitter – one of the possible samples was entitled Fruit Salad. I worked on a traditional OXO pattern with the colourway based on cross sections of citrus fruit – oranges, strawberries, blueberries – it was based on a colourway I had played with on the counter of the Woolbrokers. I wanted a bright colourway- it is a summer take on the traditional blue, red, yellow, white colourway – pinks and orange with red, shades of blue (towards the green side) with natural white as the background to lift the other colours. I wanted the colours in the 1×1 rib to shimmer as well as mirror the colour sequence in the main body. A word about steeking: after decades of knitting Fair Isle designs – it was time to give steeking a go. It was a revelation! Placing the steeks at armholes and the neck made keeping track of decrease sequences really easy. As a knitting teacher I want to spread the word that it is a useful technique, easy to do with the right materials – Jumper Weight wool is perfect. I will be teaching how to steek during Wool Week in October – participants will be making a Mug Hug in a traditional OXO pattern. It should be great fun. You can order the Alcott kit in a variety of sizes from our website here. This will come with all the yarn required to knit the kit in your specified size but please note that we cannot supply the pattern. You can find that in Issue 56 of The Knitter magazine or purchase it from Ravelry here or The Making Spot here. 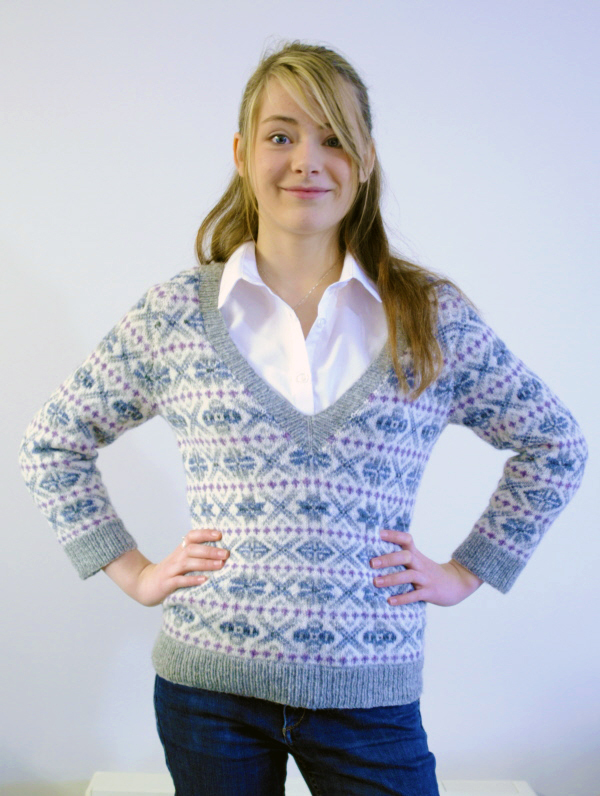 The second of these two new designs done with our yarns is the Damaress jumper by Liz Lovick. This beautiful contemporary garment is done in a classic design which lends itself well as an ‘everyday favourite’ jumper or one for showing off at a special occasions. Liz is a knitter and designer who lives in North Ronaldsay in Orkney and has been a friend of J&S for many years. She has done a number of patterns for us in the past, some of which are being made ready to print to be released soon. Quoting from the Yarn Review in the feature on the Damaress jumper in Yarnwise, Issue 59, she states that “J&S’s 2ply jumper weight has been the best yarn for Fair Isle work for generations! The shades blend well with each other, and the yarn is ‘sticky’ enough to make steeking easy”, which is a great compliment for us! You can order the Damaress kit from our online shop here. This will come with all the yarn required to knit the kit to the size you select but please note that we cannot supply the pattern. You can find that in Issue 59 of Yarnwise magazine or purchase it from Ravelry here. Hey.. You have a great micro design in woolen. 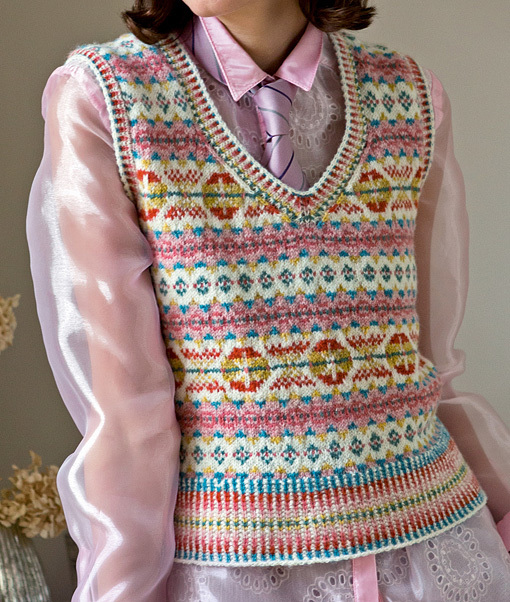 I show your sleeveless sweater image good micro design and color combination.